Instant Pot Butternut Squash Soup has a creamy goodness and rich flavor! Definitely a Fall favorite in our house. 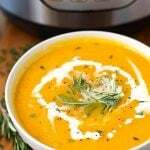 This pressure cooker Butternut Squash Soup recipe is healthy, and very delicious! My Instant Pots get quite the workout normally, but when fall and winter come around, I find I’m using them more and more. I mean, there are so many soups to make! And every time I think I’ve found a favorite, another soup edges that one out for the top spot! Paul’s favorite is my Instant Pot Zuppa Toscana, a wonderful sausage, potato, and kale soup. Bryen’s favorite is my Instant Pot White Chicken Chili, a very flavorful white bean chili that Bryen insists is served with big chunks of avocado. That kid knows how to garnish! My favorite is… I can’t decide! This Instant Pot Butternut Squash Soup is wonderful, but so is my Instant Pot Ham Hock and Bean Soup. It reminds me of growing up. Mom made it in her cast iron dutch oven often. I guess my favorite soup changes with the season! 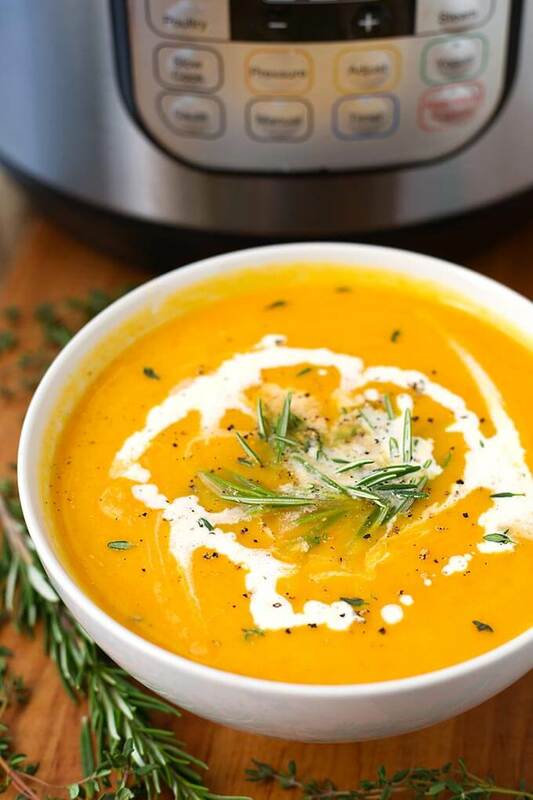 And right now I’m all about this amazingly delicious Instant Pot butternut squash soup that you can make in your pressure cooker! I have a surprise (optional) ingredient in this soup…. Pumpkin Puree! I add a little at the end to give the soup a little more sweetness, and it helps it thicken just a bit. I make Homemade Pumpkin Puree in my Instant Pot! You won’t believe how easy it is! The stuff in the can can’t compare. Pro Tip: My best advice when making Instant Pot Butternut Squash Soup is to have everything chopped and set near your pot and ready to go. That makes the process easier. It’s not hard, but who wants to run after ingredients while the onions are sautéing? 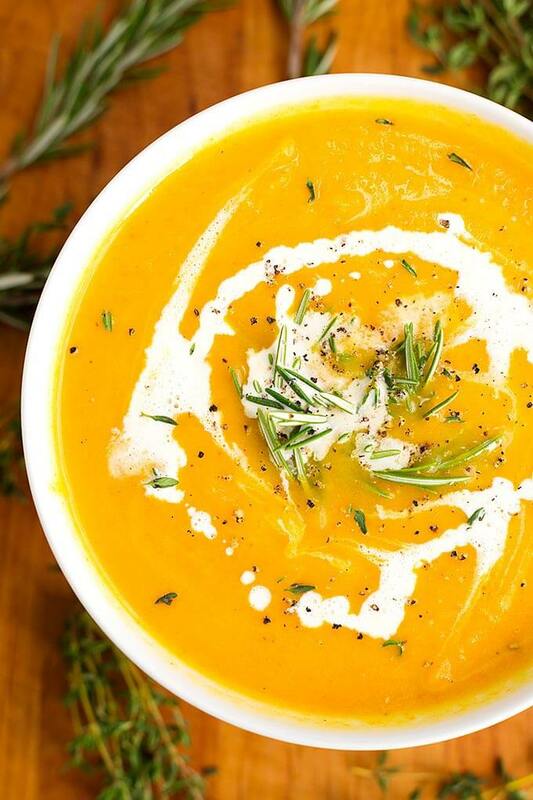 Enjoy the lovely Fall season, and snuggle up with your loved ones and enjoy a bowl of this soup! Instant Pot Butternut Squash Soup is rich and flavorful. 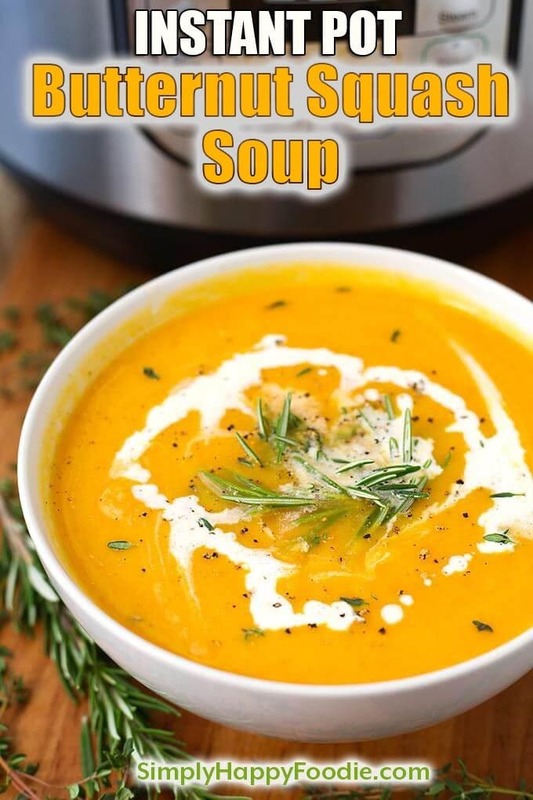 A perfect Fall soup made in your Instant Pot! Turn the Instant Pot to Sauté. When the display reads HOT, add the olive oil. Add the onion and sauté for 5 minutes or until they turn slightly translucent. Add celery, garlic, and ginger. Let cook for a minute, stirring constantly. Add carrots, apple, squash, salt, pepper, rosemary, thyme, and nutmeg. Stir well. Add broth and optional orange zest and/or cayenne powder, if using, and stir. Cancel the Sauté mode. Press the Manual (or Pressure Cook) button and then the + or - button to select 10 minutes. When the cooking cycle ends, let the pot naturally release pressure (just let it sit) for 15 minutes. Then manually release the remaining pressure. Open the lid after the pin in the lid drops. Carefully! Stir the soup and then use an immersion blender to puree to a creamy consistency (If you don't have an immersion blender you can transfer contents to a food processor or a blender. You will have to puree the soup in batches as you can't put as much hot food in either of those appliances. Be very careful, and if not sure, refer to the manufacture's instructions on pureeing hot food). Transfer the pureed soup back to the pot if you didn't use an immersion blender. Finish the soup by stirring in the pumpkin puree and the coconut milk, or cream. Taste and adjust salt as desired. Best soup yet and I’ve been IP cooking for over 2 years. I used the cream not pumpkin and added a little extra ginger because I love ginger. Move over Campbell’s Soup.